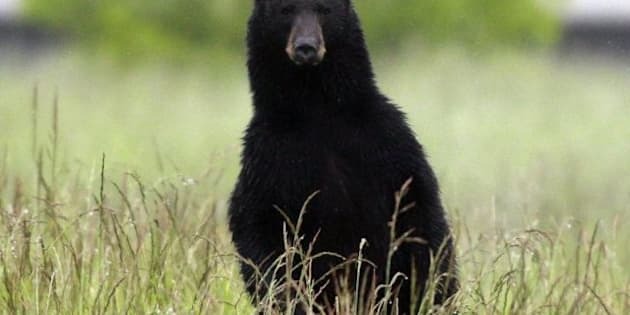 THE CANADIAN PRESS -- A freak series of collisions that sent a 300-pound bear rocketing like a bullet through a Sports Utility Vehicle to kill two people was under police investigation Tuesday. The young bear shuffled onto rural Highway 148 in western Quebec near the Ontario border where it was hit by an oncoming car, said Const. Martin Fournel of the MRC des Collines-de-l'Outaouais police. The car, an aerodynamic Pontiac Sunfire which has a shovel-like nose, flipped the bear into the air on impact -- and into the path of a Nissan Pathfinder in the opposing lane. "Coming down, it (the bear) hit the windshield at a certain angle and went right through, hit the driver, hit the passenger sitting behind her and went through the back window," Fournel said. When the bear's trajectory was compared to a bullet, the police officer replied, "Exactly." "I couldn't believe that but when I saw the pictures, I had to say yes," Fournel said of the animal's violent and tragic path. The bear came to rest on the road behind the small truck. The SUV's 25-year-old female driver from Ottawa and a rear passenger, a 40-year-old man from Gatineau, were killed. The woman's boyfriend, who was sitting in the front passenger seat, escaped with upper-body injuries. The 28-year-old man's injuries were not life-threatening. Fournel, who has been a police officer for 16 years, said the accident Monday night was the first such one he's seen involving a bear. The constable said the bear weighed around 300 pounds. "I don't think it was full-grown, according to the pictures I saw and some officers who went there who are hunters. It was a minimum of 300 pounds. A full grown-up bear, it's way bigger than that." The occupants of the Sunfire, two men aged 19 and 23, were unharmed. Fournel said police accident investigators were still talking to witnesses Tuesday. They were also looking at data such as measurements taken at the scene to determine the speed of the vehicles.